PSLT2472-BC Size: 30" H x 24" W x 60" D Features: -Solid ash legs with rubber liquid protecting boots included. -Sleek 0.75'' top is phenolic throughout offering superb lab surface material. -Adjustable glides for accurate leveling. -Highly impervious to most chemicals, acids, corrosion, stains, and moisture. -Phenolic top is thinner and more resistant than chem-res tops, for higher level and high school lab environments. -Emission free, UV resistant and meets and exceeds SEFA. Includes: -Table with storage. Product Type: -Science table. Surface Type: -Resin. Shape: -Rectangle. Number of Items Included: -5. Commercial Use: -Yes. Country of Manufacture: -United States. Dimensions: Size 30" H x 24" W x 48" D - Overall Table Height - Top to Bottom: -30". Size 30" H x 24" W x 48" D - Overall Table Width - Side to Side: -48". Size 30" H x 24" W x 48" D - Overall Table Depth - Front to Back: -24". Size 30" H x 24" W x 54" D - Overall Table Height - Top to Bottom: -30". Size 30" H x 24" W x 54" D - Overall Table Width - Side to Side: -54". Size 30" H x 24" W x 54" D - Overall Table Depth - Front to Back: -24". Size 30" H x 24" W x 60" D - Overall Table Height - Top to Bottom: -30". Size 30" H x 24" W x 60" D - Overall Table Width - Side to Side: -72". Size 30" H x 24" W x 60" D - Overall Table Depth - Front to Back: -24". Size 30" H x 24" W x 72" D - Overall Table Height - Top to Bottom: -36". Size 30" H x 24" W x 72" D - Overall Table Width - Side to Side: -48". 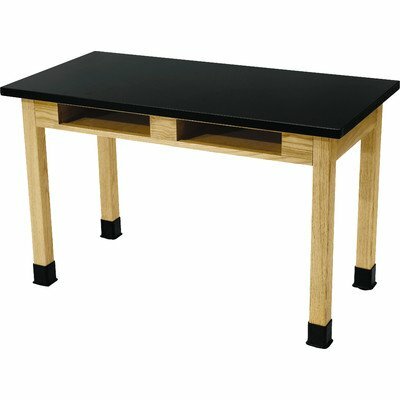 Size 30" H x 24" W x 72" D - Overall Table Depth - Front to Back: -24". Specifications: NFPA Compliant: -Yes. ANSI/BIFMA X5.5 Desk Products: -Yes.